GLENDALE – Edwin Ruano, a certified flight instructor and the chief pilot at Gold Coast Helicopters, counts on his students having guidance from an air traffic control tower such as the one at Glendale Municipal Airport. “They’re students,” he said. “They’re fairly new to aviation, so they really rely on the tower and having that extra pair of eyes. But come June 15, students at Gold Coast Helicopters may not have any help from the ground. Glendale’s is one of the four Arizona airports slated to shut down its control tower because of federal sequestration cuts. The four airports, which also include Phoenix Goodyear Airport, Laughlin/Bullhead International Airport and Tucson’s Ryan Airfield, are among the 149 smaller facilities around the country scheduled to close their air traffic control towers. The Federal Aviation Administration announced on March 22 a four-week phased closure of towers to meet a required $637 million in budget cuts. Last week, however, the FAA announced that it would instead shut off funding to all 149 airports on June 15. Ian Gregor, public affairs manager for the FAA’s Pacific Region, which includes Arizona, declined to comment but sent links to the agency’s news releases and congressional testimony in which FAA Administrator Michael Huerta said the agency would likely save between $45 and $50 million this fiscal year by closing the towers. 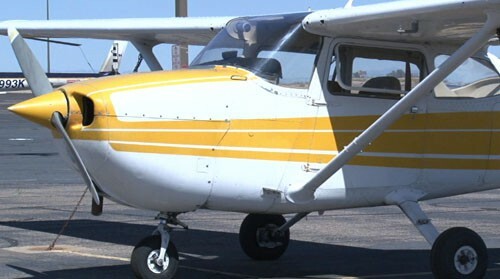 Glendale Municipal Airport serves general aviation needs, which include private flying and flight instruction. It sees between 200 and 300 takeoffs and landings a day, airport administrator Walter Fix said. The tower closes at 9 p.m., requiring pilots to communicate their intentions and relative locations directly with each other instead of receiving additional instruction from tower operators on the ground. Glendale Municipal Airport is just a few miles from Luke Air Force Base and, with the Phoenix Goodyear Airport, helps keep civilian flights out of the military airspace, he said. If the Phoenix Goodyear Airport closes its air traffic control tower, Lufthansa German Airlines, which accounts for 85 percent of incoming and outgoing flights, is likely to stop training pilots there, the airport announced in a news release. Julie Rodriguez, a spokeswoman for the city of Phoenix Aviation Department, said maintaining Phoenix Goodyear Airport’s control tower costs between $750,000 and $1 million a year. She said the airport was trying to find alternate source of funding to keep the tower open. 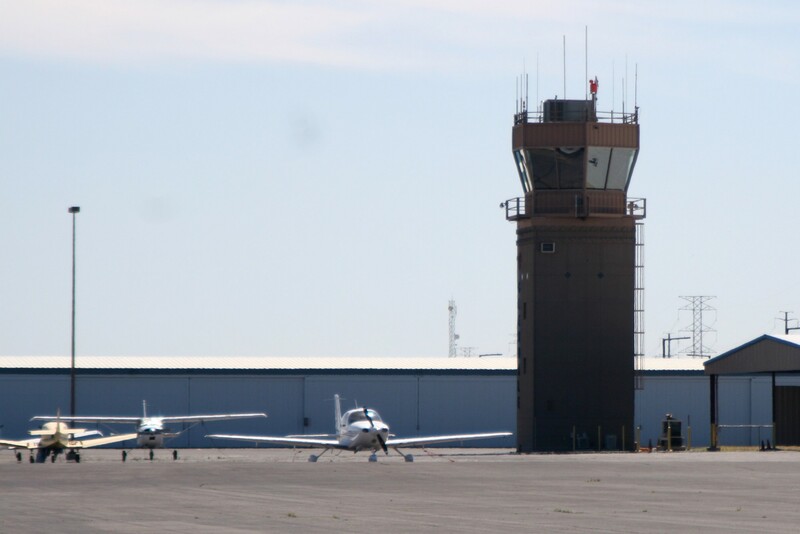 Tucson International Airport will likely see more small planes if the air traffic control tower at general aviation reliever airport Ryan Airfield closes, said Danette Bewley, senior director of operations and maintenance at the Tucson Airport Authority. Ryan Airfield, in southwest Tucson, sees about 122,000 flights each year. Tucson International Airport has a fully staffed tower and adequate runways and will be able to absorb these flights, she said. “Our primary goal is to make sure this transition is orderly,” she said. In Bullhead City, concerns over possible revenue loss and safety have prompted Laughlin/Bullhead International Airport to consider pursuing legal action against the FAA before its tower closes, according to David Gaines, the airport’s manager. Gaines said closing airport control towers is an example of the federal government reneging on one of its basic obligations: ensuring safety. “When you close a control tower, the safety of operation is of more concern,” he said. The airport sees an average of 20,000 flights a year, most of which are tourists and charter flights to or from Nevada casinos. However, the airport is close to bringing in a commercial airline, Bullhead City Mayor Jack Hakim said. He said the tower closing could be a minor setback but that he’s optimistic that the tower will only be closed briefly. “I’ve been hoping that this is just a furlough and will be open again in six months,” Hakim said. Mike Pearson, an Arizona State University professor and lawyer whose practice includes airplane and helicopter regulations, said lawsuits filed against the FAA are unlikely to succeed because the administration is legally able to pull funding. James Timm, executive director of the Arizona Pilot’s Association, said although pilots can communicate among themselves, air traffic control towers provide a safety net for planes. Federal Aviation Administration funding for control towers at four smaller Arizona airports, two of them in the Valley, is in jeopardy due to sequestration cuts. Cronkite News reporter Sasha Lenninger has the story. 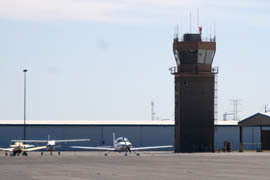 The control tower at Glendale Municipal Airport is one of four in Arizona schedule to close in mid-June because of sequestration cuts to the Federal Aviation Administration.